Allison Valchuis is a sculptor and educator living and working in New York, NY. Her work explores process, material, weight and balance through various ceramic practices, drawing and a love of good craftsmanship. 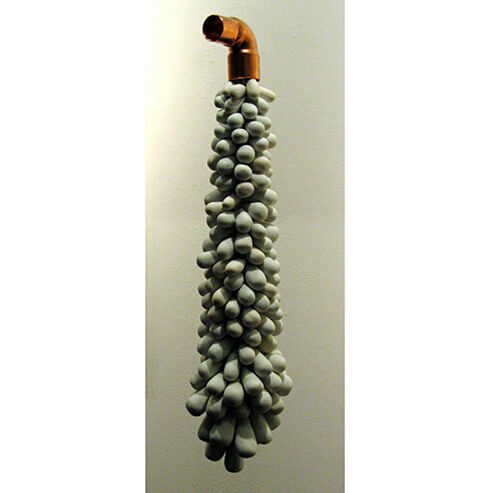 She holds a BFA in ceramics from the Rhode Island School of Design and has been working with clay since 1999. She currently holds the position of Manager of Daytime Programs at the 92nd Street Y Art Center and is also a faculty member of its ceramics department. She has been awarded the Juried Kiln God Residency at Watershed Center for the Ceramics Arts in Newcastle, ME and the Loretta Grellner Scholarship to attend Ox-Bow, School of Arts and Artists Residencies in Saugatuck, MI for glassblowing. Aesthetically and conceptually I am driven by research and exploration of materials. For the past several years I have been specifically interested in the craft of mold-making and casting, and have been actively playing with the limitations and capacity of this process and its material. Through the creation of objects and their placements I ask the viewer to consider each object and their relationship to it. My most recent work is an attempt to capture motion, breath, and other processes related to the body, and explore ideas of weight and balance.